The chill wind blew in off the North Sea, pushing in clouds and rain showers, and most tourists off the beach. Their loss, the skies were full of drama. In Adell, there was a small patch of houses/restaurants built the old-fashioned way – with thatched roofs. Thatching is a dying art. A skill that was once commonplace has fewer and fewer practitioners. It’s both a skill that is being forgotten and an art that has various styles – it is said an expert can look at a roof and tell who thatched it, or at least where they’re from. Moving onto Galway, the goal was lunch and a short walkabout. My wife is gluten sensitive, it’s often difficult to find a place that serves interesting gluten-free fare. Sandwiches? Nope. Pasta? Sorry. Sauces, gravies, things that might use wheat flour as a thickener? No can do. After wandering a bit we finally found an Asian place that served a dish with a base of rice noodles. At least many of the restaurants were upfront about what dishes contained allergens. After lunch, we found the Spanish Arch and had a quick peek into a regional museum near the pier, and an even quicker jaunt downtown to Eyre Square. Technically renamed “John F Kennedy Square” in 1965, the president had spoken there only a few months before his assassination in November 1963. But historically it’s been Eyre Square, named after the fellow who donated the land back in 1710, and for most locals Eyre Square it remains. Jane Eyre had nothing to do with it. 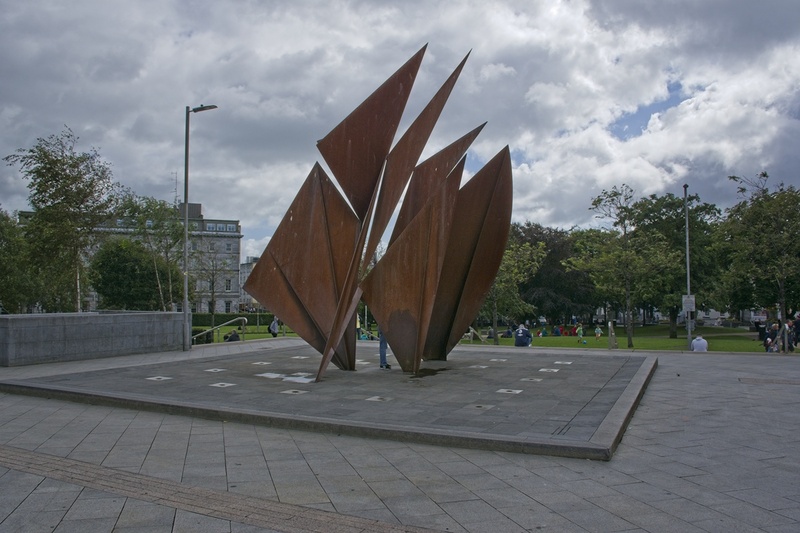 The sculpture honored the Galway Hookers. No, not those kinds of hookers. Galway Hookers are sail driven fishing and freight boats, with clean lines designed for rough Irish seas. Traditionally they have black hulls and rust colored sails. 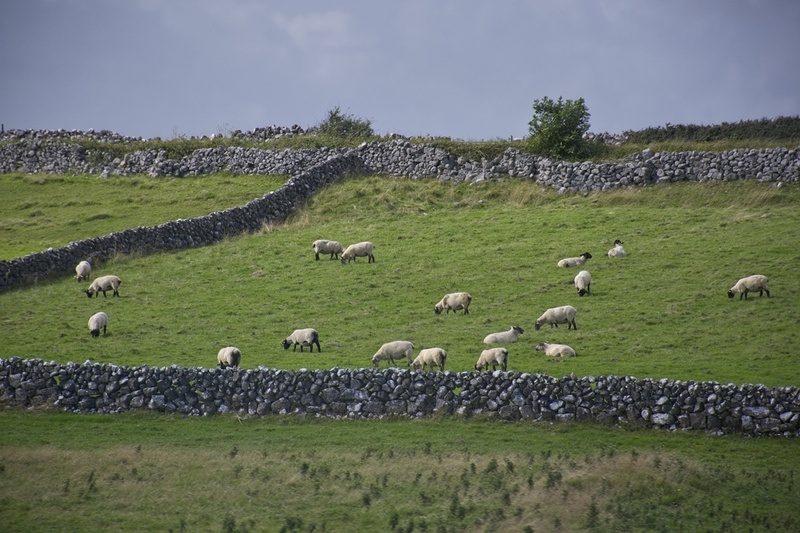 As we drove further into the northwest, we began to see the famous Irish rock fences. Dry stone construction, they don’t use mortar to secure the rocks. Each rock is cleared from the fields and carefully stacked; somehow they seem to stand the test of time. I assume the farmers do basic maintenance, but like thatching, building these rock fences is becoming a lost art. Our target this day was Enniscrone. I knew this was to be the only day on the trip we’d have ocean access for the sunset, and I had high hopes the weather would cooperate. As we sat for dinner, shafts of sunlight blasting through the west-facing windows, I worried we would not finish in time. But we did. My wife and I wasted no time heading for the beach. With the wind blasting in our faces and clouds rolling in, just enough gaps remained in the cloud cover to provide a deep breath of nature in its grandeur. It was electric, but without lightning. We took in the roar of the surf. We took in the occasional patch of drizzle, which chased the few other tourists off the beach. We took in the colors, and the smell of sea and rain, the mirror of the sky on the wet beach sands, and it was good. 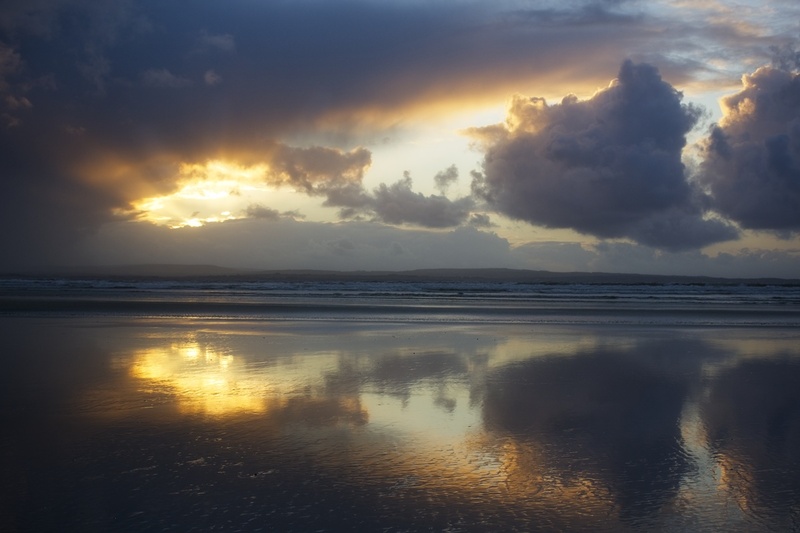 So ended the day at Enniscrone. The very name of the place invokes Ireland and the sea, the mists of selkies and other fables, and the magic of a sunset transforming a cold grey blustery evening into a thing of profound beauty. While in Galway, did you stop by The King’s Head? We didn’t actually stop in, but we found it and checked the menu for GF. (Mostly burgers and beer, if I recall). Our guide mentioned it up front and told us the story of the headsman. 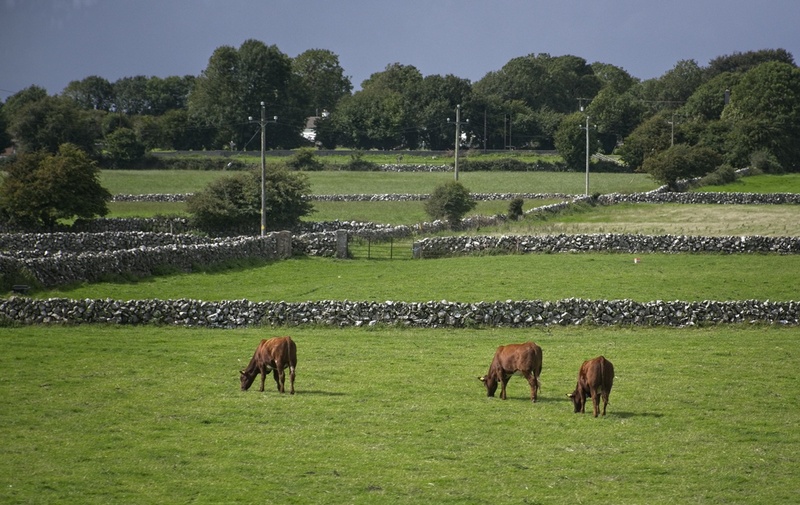 Fascinating journey through rural Ireland. I share your love of the sea with you, especially if there is a rewarding sunset to behold, Dave. The nice thing about ocean sunsets is there are no buildings getting in the way. The nice thing about this one was there was still something interesting in the foreground. 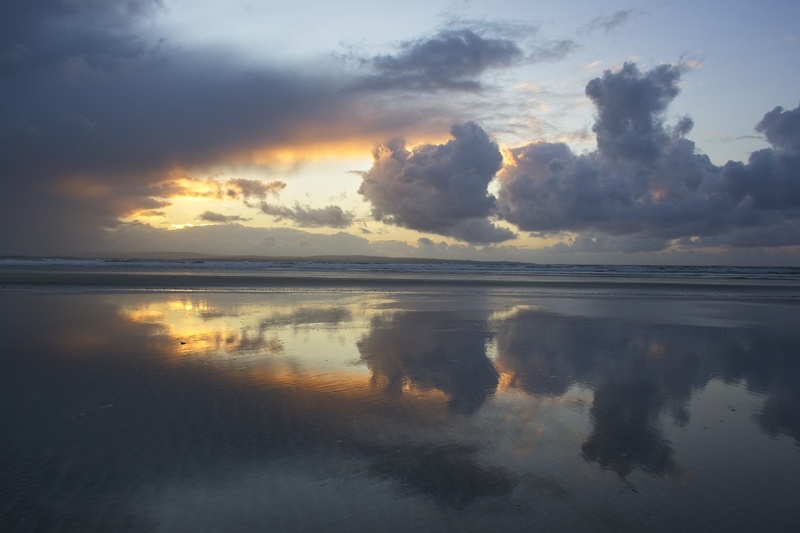 Dave your photos of the ocean, clouds and the reflections are just simply gorgeous!!! Luckily I live near the ocean or I would be pining for that right now! I share your joy of stone packed walls – works of art… which we enjoyed seeing around olive tree groves in Northern Spain. Thatched roofs are indeed a skill and an art and a good eco solution in building. The issue can be that of course they are not permanent which means replacement every few years and from experience I can tell you that scorpions love to live in them! I was thrilled that on our one shot for an ocean sunset we scored a dramatic one, even if we got a little wet and blown around. As for those old skills, I wonder if they’re like old languages – maybe a few scholars that study ’em, but nobody really using them. Time moves on. We have dry stone walls in many parts of England, too. It’s certainly an art to build them, but fortunately there is a fair bit of interest in keeping that tradition going, so a lot of folk have learned the skills. When I was on Dartmoor a month or so ago, I saw a long stretch of a wall that had been re-built earlier this year; apparently it took about six months to complete. I’m glad to hear there’s interest in learning the tradition of dry stone walls, even if it’s just for hobbies or craftwork. Rock walls never caught on over here; maybe not enough rock of the right size, maybe too much barbed wire tradition. Gorgeous photos. Haven’t heard of Enniscrone so I’ll look it up for the future. I think for the Irish it’s mostly known for the beach and the local golf courses. It’s a little off the beaten path. I had to look that up (I’m pretty weak on art history) – I can see your point in some of his paintings. What a beautiful sunset! I don’t really take the sunset pictures myself, but enjoy the other photographers’ work 🙂 How did you like our tides? Aren’t they magnificent. I remember our tour guide talking about living in Italy and wondering why the shorelines were so static. We have good sized tidal changes around here too – maybe not quite as large as yours but still landscape changing. That section of beach at Enniscrone was pretty flat, so when the tide went out it went way out. It all looks quite idyllic. Still lots of dry stack walls in western Pennsylvania! We had one at our house growing up, and there are a bunch out in the countryside. The sunsets are gorgeous. So that suggests you may know some of the tricks for stacking a stable dry stack wall? I have admired many a wall but not built any myself! From simply watching, I would say stone selection is key; the builders always seem to be doing a puzzle, and the really good ones can select or reject a given stone for a given spot in mere seconds. Ireland is a special country, no! Particularly outside of the cities. These are all beautiful images. Thanks, Otto. Ireland is a special country, yes. I suspect most countries have something special if you look in the right places. That’s a heck of a great way to finish up the day, those sunset shots are like paintings. They’re all great, but I really like the 2nd last one where you angled up to focus on the cloud. I see someone reported dry stack walls in Pennsylvania, and my grandparents’ houses there had retaining walls like that, that have hung together for over a century. There’s still a lot around NY, too, but the farmers don’t have time to make new ones. But the wineries will sometimes have people construct them, and sometimes top them off with sod, which I saw them do some places in England. That was cool earning about the rock wall. Things like that amaze me. I was watching the 1st episode of Cosmos with Carl Sagan. Hearing the ancient Greeks knew the Earth was round and the information got lost was a “Hummm….” moment. I wish time machines were real so we could see what things were like in the past. 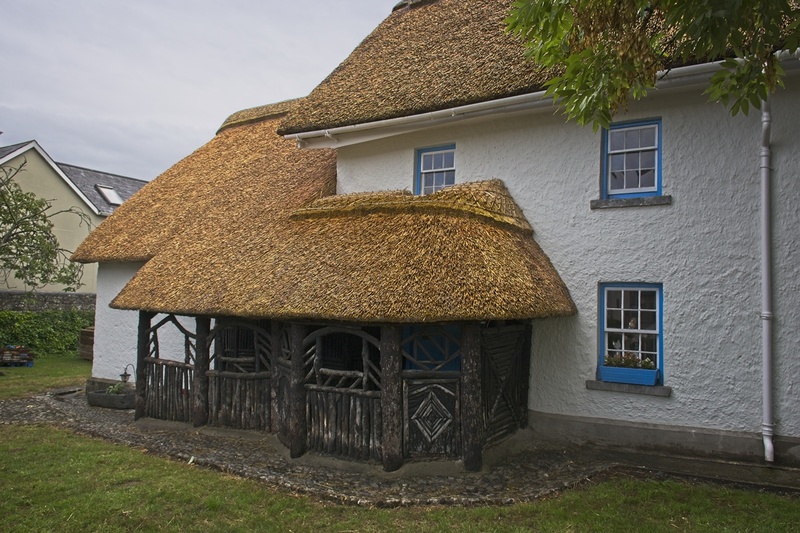 It is interesting to see the Irish thatching and stone wall building crafts preserved in Ireland. There is nothing quite like a beach sunset at low tide. You captured a beauty. Thanks, Joe. That’s one thing about living out west here in the USA, nothing is that old. Even the ghost towns don’t really show “ancient” crafts. 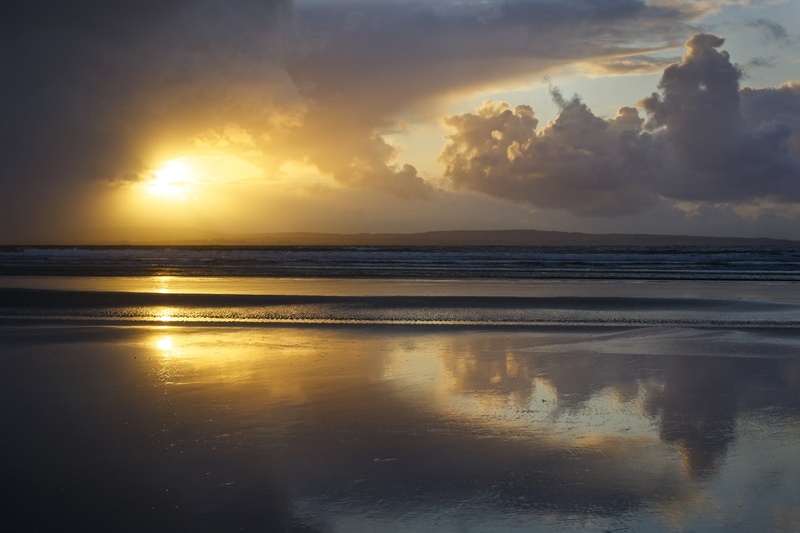 Truly awesome beauty you found here in Enniscrone, Dave — thanks for taking us along. Your photos are fantastic, and I enjoyed the narrative too. 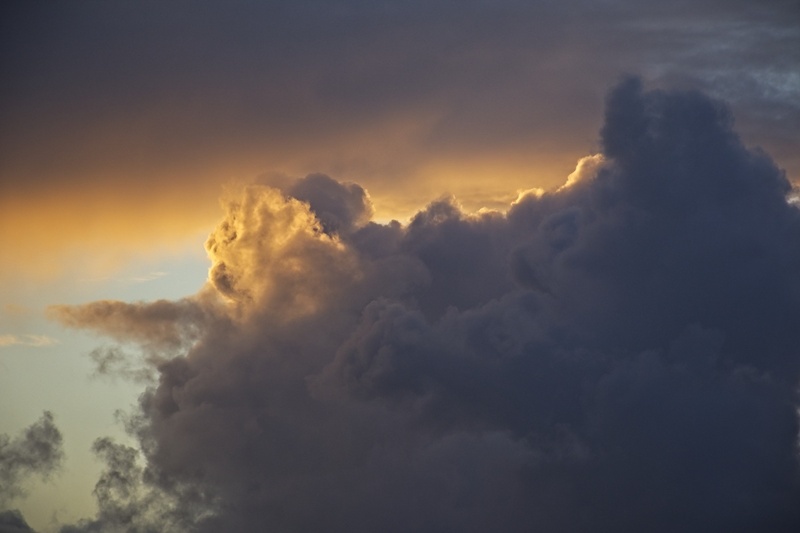 I especially like those stunning sunset cloud formation photos. Also liked the highlights of the lost arts of roof thatching and stone walls. Oh, those clouds are gorgeous! That must feel so good, you got the payoff of a beautiful sunset right? Nailed it! We went the other direction, from Galway (Salt Hill actually) down to Killarney, then over to Cork and out to Waterford, on to Wales etc. Sometimes we get lucky. We almost got unlucky in Cork, we got turned around and had to ask a few locals for directions to a reference point, of which half had not heard of. Still made it back to the bus in time. I heard dry stone walls last longer than mortar ones, primarily because of the skill used in building them. I hadn’t heard that, but they certainly are more than cookie cutter walls. The sunset images are just priceless – how lucky you were to be there at that moment. And your last paragraph sums it all up perfectly. The mystique is there! We seriously lucked out. I must have been living right, at least for a little bit. Wow. Those skies. « Biblical » is the word that comes to mind. “Biblical.” All it needs is Charlton Heston, berobed and staffed as Moses, wandering down the beach, shouting incantations. Nah. Think I’ll just stick with nature’s grandeur.